Hurricane Earl – the fifth named storm of the 2016 Atlantic hurricane season – is “not a threat to Bermuda” according to the Bermuda Weather Service, which said that the storm’s closest point of approach to the island within 72 hours has passed. The U.S. National Hurricane Center said, “Maximum sustained winds have decreased to near 75 mph [120 km/h] with higher gusts, and additional weakening is expected as the center moves farther inland. “Earl is forecast to weaken to a tropical storm later this morning and to a tropical depression by Friday morning. 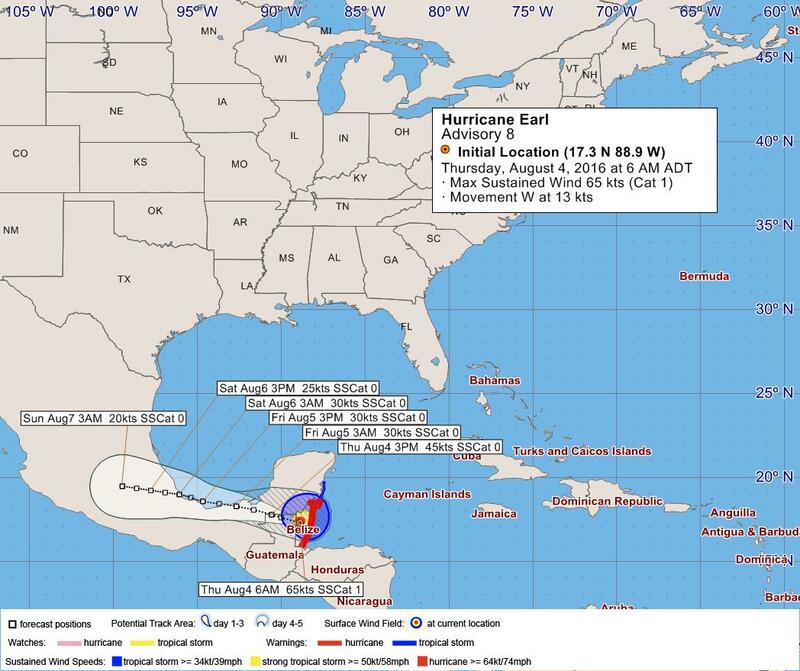 A story at Weather.com says, “Hurricane Earl made landfall early Thursday morning near Belize City as a Category 1 hurricane with estimated maximum sustained winds of 80 mph. “Now, the main concern going forward will transition to rainfall flooding. “Winds gusted to 58 mph for several hours overnight at Phillip Goldston International Airport west of Belize City as the eye of Earl passed just to the south of that location around 2 a.m. EDT.